The United States Congress designated the Izembek Wilderness (map) in 1980 and it now has a total of 307,982 acres (307981.76 acres, technically). All of this wilderness is located in Alaska and is managed by the Fish and Wildlife Service. On the tip of the Alaska Peninsula, Izembek Wilderness sees a quarter-million migratory birds land every fall, including the entire world's population of black brants and thousands of Canada and emperor geese, ducks, and shorebirds. Izembek Lagoon, which is enclosed by the Wilderness, contains one of the largest eelgrass beds in the world, providing food and shelter for migratory birds. Tundra swans live here year-round. Gray, Minke, and killer whales migrate along the coast by the thousands. Sea otters are the most common inhabitants of the lagoon. Hundreds of thousands of salmon begin and end their life cycles on the refuge. The brown bear habitat is unparalleled, and caribou wander through in herds. Crowberry, blueberry, and salmonberry are only three plant species of over 300 that are found in the Wilderness. Strong winds and acidic soils common to this region have resulted in plants that are hearty and low-growing. Smoking volcanoes and glaciated mountains tower over lakes and meandering rivers that drain into lagoons opening on the Bering Sea. The castle-like Aghileen Pinnacles form a portion of the boundary between Izembek Wilderness and the Alaska Peninsula National Wildlife Refuge. 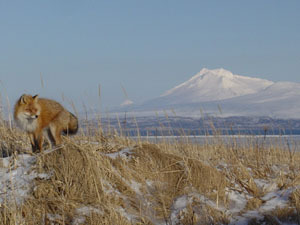 Izembek Wilderness makes up the entirety of Izembek National Wildlife Refuge with the exception of the land along a gravel road system and several private inholdings. Elevations in the Wilderness vary from sea-level in many of the wetlands to over 5,800 feet atop the apex of Mount Frosty, a Holocene volcano. Hunting and fishing draw many visitors; however, no maintained trails exist and the terrain can be rugged. Average temperatures range from 47 F to 56 F in summer and 24 F to 33 F in winter. Izembek Wilderness receives 41.9 inches of annual precipitation. Planning to Visit the Izembek Wilderness? How to follow the seven standard Leave No Trace principles differs in different parts of the country (desert vs. Rocky Mountains). Click on any of the principles listed below to learn more about how they apply in the Izembek Wilderness.